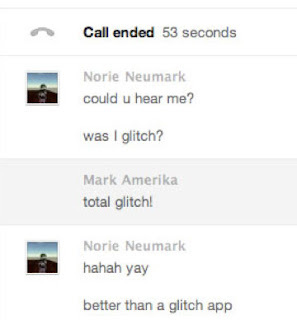 My recent performance art project with sound artist Norie Neumark is GlitchenSkypen. Norie was on a flight from SFO to JFK and had an Internet connection on the plane and so thought it would be a good time to Skype. When her call came in, I nestled my iPhone into the groove of my laptop that divides the screen from its cover and proceeded to play. The end result is what you hear here. Did I mention that Norie is also the co-author of the anthology of art writings entitled At a Distance? Who better to conduct what is perhaps the first performance art Skype session from a plane, then Norie herself?